The solution for this test is 1. But what is the pattern? This one, I think, is a lot easier than it seems. The shapes of the objects aren't relevant, so ignore them. In the first set, we see a sequence: something is on the top and bottom, something is on the left, and something is on the right. Rotate this sequence 90 degrees, and you end up with the bottom row. Now something is on the left and right, and something is on the top. This means that, in the third object, something is on the bottom. 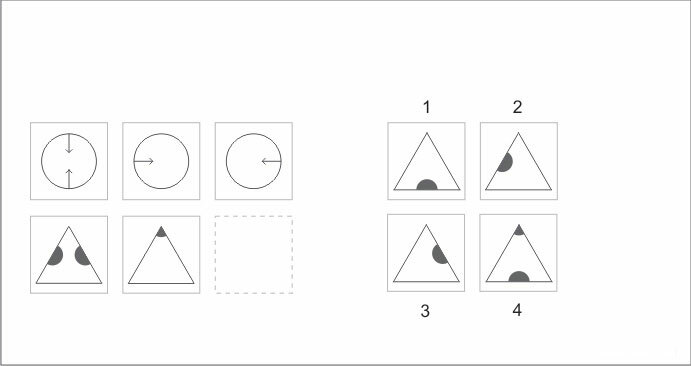 Since the bottom row object happens to be a triangle, the answer is #1: a triangle with something in the bottom. I think that the arrow at the top of the circle, pointing to the bottom, refers to the semi-circle at the right side of the triangle, and the arrow at the bottom of the circle (pointing to the top), refers to the semi-circle at the left side of the triangle. So, the arrow at the left of the circle (pointing to the right) refers to the part of the circle at the top of the triangle, and then the arrow at the right side of the circle (pointing to the left) refers to the semi-circle at the bottom of the triangle, which gives #1 as solution. We have a container shape (triangle or circle), and then an object within it. Treat the container object, separately from its content. 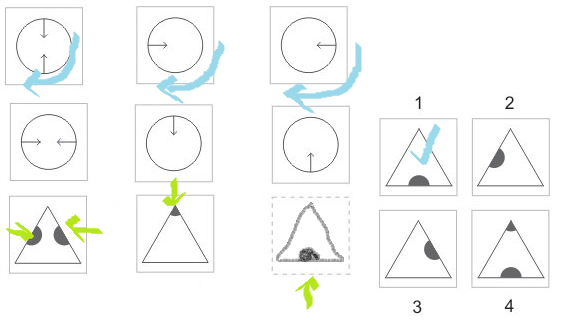 So the answer is 1 because it is showing just the reflection of the circle, within the container triangle. Difficult IQ test question: What is the box suggesting?